Winter is coming and that means the skiing season is finally upon us. Nowadays, ski resorts can boast more than just their slopes with many of them equipped with wellness facilities, microbreweries, shopping opportunities and even Michelin-star restaurants. For many skiers, nothing beats the famous resorts across Europe with many places dotted across the Alps and Pyrennees among the best-rated on the planet. 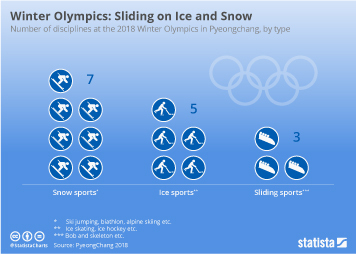 Other countries have been catching up in recent years and today, the United States has the highest number of skier visits of any single country per season, according to a recent ski tourism report by Laurent Vanat. Colorado in particular welcomes an avalanche of skiers every winter and they are attracted by the pristine slopes of the Southern Rocky Mountains. Vail Mountain, Breckenridge and Keystone are among the most popular destinations and they attract millions of skiers every season. 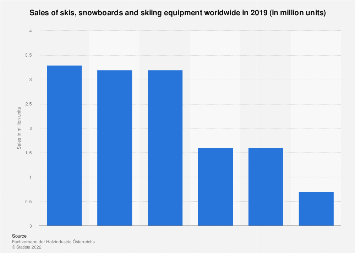 In total, the U.S. has 55 million skier visits per season (based on the latest 5-year average), and most of them are U.S. based. 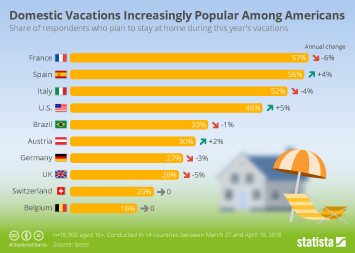 France is close behind in second place with 54 million visits per season and it has a higher proportion of foreign skiers than the U.S. Austria is also well known for its excellent skiing resorts and facilities and it rounds off the top-3 with 52 million visits per season. 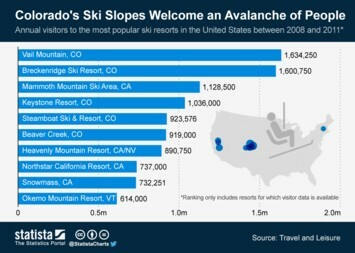 This chart shows the average number of skier visits per season (latest 5-year average).